Dynastic Networks as Vehicles for Cultural Transfer: sources, methods and theoretical approaches. Wolfenbüttel, 15th to 17th July 2014. 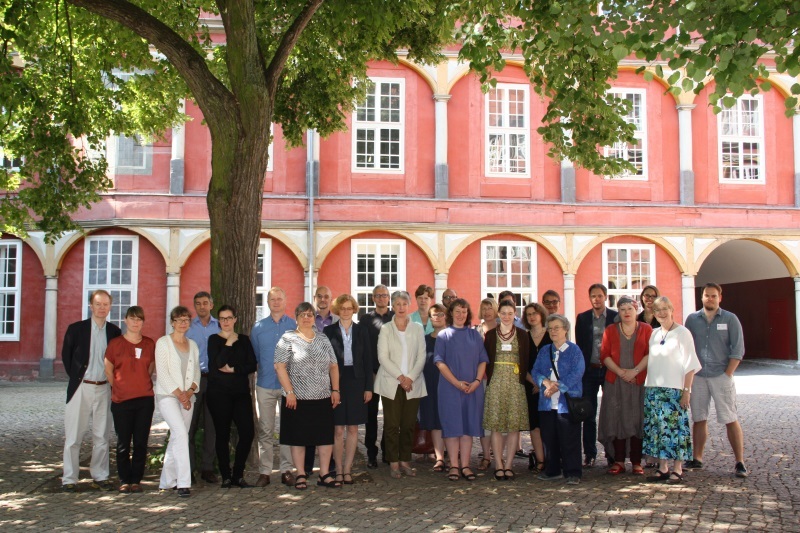 The first Marrying Cultures workshop brought together an international group of experts on court culture, both from university and museum contexts, in order to discuss approaches to object-based research relating to the cultural impact of consorts in the early modern period. Several of the participants have either just prepared or are in the planning stages for major exhibitions in which consorts play a key role: this year’s Hanoverian 300-year Jubilee exhibitions and related events and publications in London, the exhibition on the origins of the Albertina in Vienna, and the 2015 exhibitions on Hohenzollern women in Berlin and on Queen Hedwig Eleonora in Stockholm. The conference opened on the first evening with a public lecture by Clarissa Campbell Orr who provided a panorama of 18th-century Hanoverian consorts and their German networks, paying special attention to their collecting activities and their cultural role in Britain. Particular emphasis was placed on depictions of the consort as reader and on the book collections put together by Charlotte of Mecklenburg-Strelitz, wife of George III, who was well-known as a patroness of botanists, musicians and painters, preoccupations that were reflected in the intellectual scope of her book-buying and in the education of her children. The conference was planned as an informal meeting at which discussion and exchange of ideas would take precedence over the usual lecture format. A publication of proceedings is thus not intended, but several of the participants will be contributing to future publications within the scope of the Marrying Cultures project. The two following days were given over to short presentations followed by round table discussions. After a brief overview by the project leader, Helen Watanabe-O’Kelly, each member of the Marrying Cultures project team presented an aspect of their current research. Almut Bues presented first findings from her examination of the inventories and correspondence of the Polish princesses Katarzyna Jagiellonka, Duchess of Finland and Queen of Sweden, and Zofia Jagiellonka, Duchess of Braunschweig-Wolfenbüttel and Anna Queen of Poland. They were heirs to the extensive property of their Italian mother, Bona Sforza, some of which was thus transferred from Italy via Poland to Turku and Wolfenbüttel. Both doctoral students within the project, Urszula Zachara-Związek in history in Warsaw and Maria Skiba in musicology in Hanover, will be researching Polish consorts. Jill Bepler’s initial research on the family networks of Hedwig Eleonora of Holstein-Gottorf, Queen of Sweden (1636-1715), reveal how her birth dynasty adapted to having a queen in the family and what this meant in terms of allegiance, political and confessional support and the expectations of the next generation in terms of education, marriage, travel and career opportunities. This suggests a pattern of gendered cultural exchange which was conservative rather than innovative. It points to the staying power of cultural and confessional models which, before the advent of French as the universal language of correspondence, were shored up by vernacular correspondence with the home dynasty and reflected in the consort’s private library. The Portuguese princess Catarina of Braganza, Queen of Great Britain (1638-1705), subject of the work by Adam Morton, was one of the few foreign consorts to have returned to her country of origin in later life. Catarina provides an example of how confessional difference, political circumstance and childlessness could combine to prevent the assimilation of the foreign consort and to channel and focus popular aggression. The movement of goods, information and people between Saxony and Sicily, and later Spain, is the subject of Helen Watanabe-O’Kelly’s investigation of the cultural role of Maria Amalia of Saxony, Queen of the Two Sicilies and Queen of Spain (1724-1760), as traced in surviving correspondence in Dresden, Naples, Vienna and Simancas. Using network analysis and the example of Luise Ulrike of Prussia, Queen of Sweden (1720-82), Svante Norrhem and Elise Dermineur are examining the significance of her wide-reaching correspondence, both personal, scientific and diplomatic, and the reciprocal exchange of architectural models between Prussia and Sweden in the 18th century. Received opinion on Louise Ulrike’s significance for the Enlightenment in Sweden and her negative political role invite re-examination in the light of her close collaboration with her husband, for which she may have provided the ”public face”. Volker Bauer set the theoretical context for a deeper discussion of cultural exchange at court by developing a general framework for dealing with the different dimensions of transfer between early modern courts and dynasties based on examples from recent literature dealing with the situation in the Holy Roman Empire. He explained that cultural transfer between courts, residences and dynasties took place due to the basically competitive structure of the European society of princes, in which communication played a key factor, with printed accounts of court events and ceremonial allowing a constant evaluation and comparison of what occurred at other courts. A central trigger for cultural exchange consisted in the novelty value attached to it. Consumption and thus market forces began to dictate even courtly cultural exchange. The common assumption in current German historiography of early modern courts is that the courts (and also society as a whole) consisted not primarily of people, but rather of communication. This is consistent with the notion that the court served mainly as a “point of contact”. Thus, cultural transfer, when seen as a form of communication using the channels of persons, objects and written information, is not just one single cultural practice among others, or one field of research alongside that of dynastic politics or social strategies, but is a constituent and defining element of the dynastic society of princes and courts. Within the discussion other aspects were raised, such as the existence of dynamic and retarding factors in exchange, the deliberate hybridisation of cultural models, the varying strategies and attitudes to transfer and exchange dictated by the size and location of a court, especially the interaction of a court with a metropolis (London, Paris), the switch from cultural transfer to the primacy of scientific exchange in the 18th century, and the central significance of differing life cycles of dynasties, with longevity affecting the pace of possible change and failure to produce issue leading to rupture and dynastic crisis with far-reaching repercussions. In his presentation on the Albertina in Vienna and the role of the male consort, Albert Casimir of Saxony-Teschen (1738-1822), who married the daughter of Maria Theresia, Marie-Christine, in 1766, Wolfgang Schmale elaborated on their joint collecting activity and Marie-Christine’s own considerable artistic output. In their political roles as Imperial governors in Bratislava and Brussels the couple’s collecting contributed to Habsburg self-representation, a role funded by their generous allowances. This representational role continued when they returned to Vienna. Their scholarly collection of prints and engravings, assembled with expert help, was a feature of Enlightenment court culture and provided access to information on the arts and sciences selected on art historical principles and connoisseurship that had begun to develop in the Renaissance. In the wake of the successful 2014 exhibition Die Gründung der Albertina there are plans to deepen research on Albert and Marie Christine as a ”collector couple” by preparing digital editions of Albert’s manuscript memoirs, the surviving letters exchanged by Albert and Marie Christine, as well as their extensive correspondence with their advisor, Alexander Freiherr von Seckendorff. This contribution again focused attention on the importance of the dynamics of the dynastic couple (as in the case of Louise Ulrike of Sweden) and the varying public and personal, often gendered, perceptions of their activities. Alfred Hagemann, Nadja Geißler and Kristin Bahre, members of the team preparing the exhibition Frauensache - wie Brandenburg Preussen wurde (Women’s business), which will take place in Charlottenburg in summer 2015, presented and discussed aspects of their concept for the exhibition, which will be one of the first in Germany to concentrate exclusively on narrating the building of a dynasty and the formation of its identity from the perspective of its female members. The exhibition will bring together objects that demonstrate three main themes: international dynastic networks, the various roles women could play at court, and their possibilities for instigating change, for trend-setting and innovation. In the presentations that followed, discussion focused on the problems involved in identifying and interpreting individual items from museum collections or archival sources in terms of cultural exchange. Joanna Marschner used the example of a precious ivory, gold and enamelled egg that can be taken apart like a Russian doll containing a hen, which itself contains a crown that opens to reveal a ring engraved with a crown and an electoral hat. Originally given as a gift by Liselotte of the Palatinate (Paris) to Caroline of Ansbach (London) in 1717, the decoration on the ring is probably to be seen in the context of a letter in which Liselotte stressed that she and Caroline shared the fact that they both came from electoral families and had married into royalty. It was therefore a gift with a very strong personal and emotional message, aimed at creating and strengthening bonds over distance. That the egg itself is now in the royal Danish collections in Amalienborg is attributable to the practice of jewelry being inherited in the female line, highlighting inheritance patterns as a major impetus for the movement of cultural artefacts between dynasties. Mara Wade demonstrated a similar creation of a highly symbolic and representative object by looking at the so-called Golden Horn, now in the Dresden collections. The object was a replica and re-working of one of the famous 5th-century Nordic golden horns discovered in Denmark 1529. King Christian IV had given the object to the heir apparent and after the former’s untimely death he entrusted it to his daughter-in-law Magdalena Sibylle for as long as she remained unmarried. When she returned to Saxony to remarry in 1652 she had a free copy made, incorporating jewelry from the dowry of her Danish marriage into the replica and inscriptions recalling her royal connections, thus creating a memorial object combining symbols of the Electoral Saxon and Danish dynasties that she took with her to the minor branch of the Ernestine Saxon dynasty into which she married at Altenburg. Again, this object with its dowry jewelry found its way to Dresden via inheritance through the female line whereas other objects that she brought back from Denmark can be traced through the male line to Gotha. Concrete archival evidence confirming the origin and the paths of objects is often difficult to come by, and the presentations by Ann Grönhammar and Anu Lahtinen both addressed this problem in differing ways. Using three rings of ostensibly oriental origin that are now in the Royal Armoury in Stockholm and belonged to Queen Hedwig Eleonora, Ann Grönhammar sketched the Queen’s upbringing in Gottorf with its librarian Adam Olearius who had travelled to Persia and written an account of the journey, as well as the links between the Stockholm court and Swedish orientalists and military campaigns which included the capture of the Georgian Prince Alexander Emeretia, placing these exotic objects in the context of the court’s cultural contacts. Anu Lahtinen took the opposite approach and in view of a total lack of archival evidence deconstructed the attribution of an ”Indian” chest and chair said to date from around 1570 and to have belonged to the Swedish dowager Queen Katarina Stenbock. She carefully traced the way in which the attribution was originally made on the basis of contextual evidence and reliance on expertise in dating and stylistic analysis. Julius Bryant, curator of the recent exhibition William Kent: Designing Georgian Britain at the Victoria and Albert Museum in London, showed how combining new textual evidence with careful physical examination of an ostensibly well-known object, in this case the 2.5m-long wooden architectural model for a new royal palace at Richmond, designed by Kent for George II and Queen Caroline and presented to them in 1736, caused him to reappraise the Queen’s role in its interior design. A newspaper records the Queen viewing the model in 1735 when the King was in Germany, hunting. The new palace was described as a hunting lodge for the King, implying that the Queen was commissioning a building that would make the King’s hunting trips to Germany unnecessary. When the roof of the model was removed for the first time at the request of the curators, it revealed several unusual and as yet unexplained elements in the interior design. Merit Laine also showed how, by re-examining archival material, ideas about patterns of cultural exchange can be reversed. The German-born architect Georg Greffenhofer is assumed to have trained in Bayreuth, gone to Sweden as an architect, where he was involved in the design of the theatre at Drottningholm, and then been appointed court architect in Eutin. Archival evidence shows, however, that he was in fact sent as an journeyman apprentice to Stockholm from the court at Eutin, which had close dynastic links to Sweden, and that this was where he learned his trade, taking Swedish models back to Germany rather than importing German models to Sweden, which by the 18th century had become a Northern European centre for the training of artisans and architects. Caroline Hibbard provided a differentiated view of cultural exchange by close examination of the account books of Queen Henrietta Maria of England, who brought a large entourage of cooks and dressmakers with her from France when she married, many of whom stayed on. There was a large cross-confessional expatriate French community in London providing consumer articles for the court and making their fortunes as mercers, lace-makers and textile workers. The second-hand garment market of the metropolis ensured that articles of clothing were not exclusive to the court and that hybrid fashion trends could evolve. She stressed that financial records are an untapped source of documentation of cultural exchange and that particular attention should be paid to researching the borderlines between childhood and adulthood and the education and the environments that schooled the taste of young princesses directly before they left their native countries to marry. Cross-confessional cultural exchange was also the subject of the presentation by Katrin Keller, who, by taking the example of the Catholic Maria of Inner Austria, who stemmed from Bavaria, and the Protestant Anna of Saxony, a Danish princess, showed how both used their correspondence and their far-flung dynastic networks to engage in large-scale import of foreign plants and herbs and in the improvement of local food production and medical care. Maria used her connections to Spain and Italy, where her daughters had married, to obtain objects for her own Kunstkammer and to supply her brother in Munich with exotic objects for his own collections. The vast correspondence networks of both women reflect the channels through which goods and information were exchanged across confessional boundaries. Christina Strunck used the example of the Medici duchesses, Maria Magdalena of Inner Austria and Christine of Lorraine, who exercised joint regency during the minority of Ferdinand II de’ Medici, in order to highlight the overlap in their cultural and political influence and their patterns of collaboration in the interest of dynastic unity despite the conflicting loyalties in respect of their birth dynasties. Susanne Rode-Breymann raised the questions of whether the foreign nationality of a bride is enough to signal cultural exchange and what actually are the determinants of cultural difference. When Eleonora II Gonzaga arrived in Vienna in 1651, ostensibly bringing with her Italian music and promoting Italian opera, she was in fact building on a solid Italian music tradition that had been introduced at the Viennese court by Eleonora I Gonzaga on her arrival in 1622. Italian music was thus not tied to the ”Italian nation” but was a feature of court culture. In the final discussion it became clear that alongside the ruler himself the important figure of the dowager, other important female family members living at court, or established circles of female courtiers, must be taken into account when measuring what degree of cultural agency was available to a young consort. Two papers approached the consort via the medium of portraiture. Allison Goudie examined an ivory miniature of Maria Carolina, Queen of The Two Sicilies (1752-1818), and situated it in the context of the double wedding in 1802 between the Neapolitan and Spanish Bourbons. She analysed the use of symbolic attributes, such as the medallions of the Order of the Starry Cross, worn by Maria Luisa of Spain (1751-1819) in a portrait medallion and in Goya’s portrait of the family of Carlos IV of Spain. Pablo Vázquez Gestal also used portraiture to interpret the performance of queenship visible in depictions of Elisabetta Farnese (1766-1692), Queen of Spain, who was both consort, ruling queen and heir to the Duchy of Parma and the Farnese collections. The Final Discussion raised a number of issues for further thought and research, among them were questions of dynastic continuity and tradition, rupture and innovation; the dynamics of actors, status, location and cultures of emotion; confessional difference; economics and market forces; language barriers and retention of language ties via correspondence and reading; the effects of exile on cultural exchange; cultural memory and the contingencies in the creation and modification of the historical assessment of individual consorts.